Africa, 1943. As war rages across the bloodstained African deserts, a new Artifact awakens in a secret German lab on the Algerian border. The Thornspawn have risen. 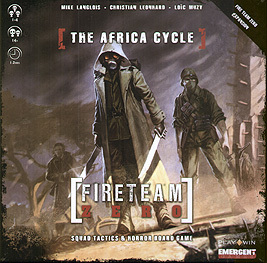 This expansion for Fireteam Zero takes the fight for humanity’s survival to the war-torn deserts of Northern Africa! Meet the Thornspawn, an entirely new monster family! Comes with 8 Scavengers, 4 Wooden Men, and the avatar of the Elder Thorn: Prime! Find and equip ordinary objects that have been imbued with strange arcane energy. Use caution, however, as some of the powers they grant come at a price. And some are simply evil. Comes with two 4-card upgrades and an all new Focus for each hero! AN ALL NEW 3 ACT OPERATION AGAINST THE THORNSPAWN: STICKS AND BONES. This operation features Act I: Sowing Seeds, Act II: Fertile Ground, and Act III: Reaping. BETWEEN THE BONES OF THE EARTH – Something is growing in the darkness under the desert. Infiltrate the lost Tomb of Kuthal-Har and attempt to purge the evil you find there before it consumes you! LOST AND FOUND –A disturbing radio transmission draws you to an abandoned forward base, where you discover what happens to those who seek to claim the power of the Artifacts for themselves. CLOCKWORK – Engage in a desperate struggle against madness and compulsion in the deep forests of Tunisia. The soft earth is littered with bits of rusted tin and corroded gears and the only sound is the slow ticking of a giant clockwork heart. Face the enemy on the new Wunderwaffe Secret Lab and Desert Ruins maps! 4 new double-sided 12"x12" map tiles included! Expansion set for Fireteam Zero. The core set is required to play.